Beers Made By Walking: 2013 Beers Made By Walking - October 8th in Denver! 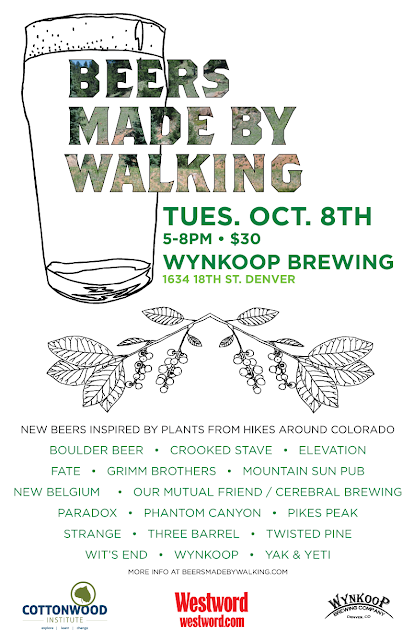 2013 Beers Made By Walking - October 8th in Denver! Each beer in this series is innovative in that they are drinkable landscape portraits of areas throughout Colorado. You'll get to taste a portrait of Boulder’s historic Chautauqua Park, the Palmer Lake Reservoir Trail in Colorado Springs, a beer inspired by a neighborhood stroll in Denver, and many others. Boulder Beer, Crooked Stave, Elevation, Fate, Grimm Brothers, Mountain Sun Pub, New Belgium, Our Mutual Friend with Cerebral Brewing, Paradox, Phantom Canyon, Pikes Peak, Strange, Three Barrel, Twisted Pine, Wit's End, Wynkoop, and Yak & Yeti. The full list of beers is available here. As part of its daily online coverage of Denver's dining and drinking scene, Westword closely follows the Colorado craft beer industry. Find their stories at cafesocietyblog.com and on Facebook.